How can XJFlash be 50 times faster than programming with conventional boundary scan? With conventional boundary scan each signal change requires one complete test vector to be scanned through the JTAG chain. XJFlash configures the FPGA with a programming algorithm so it can change these signals at its operating clock speed. JTAG is still used to stream the data to be programmed into the FPGA but the control of the signals on the board is done by the FPGA. I use a fast flash programmer already, why should I consider using XJFlash? XJFlash makes use of the FPGA resources already designed into the board. This means it is possible to use a single JTAG tool to boundary scan test the board and program it in one step, making it faster than swapping between tools on the production line. Furthermore, using in-system programming removes the need to pre-program flash devices, allowing the latest flash image to always be used and allowing the same tools to be used during development, production, and repair. What flash devices are supported? XJFlash has built-in support for a wide range of parallel and serial NOR flash devices. Support for NAND devices is also available. What if I want to program a type of device that's not listed? The range of devices programmable using XJFlash is continuing to grow, so if you want to program a device that is not currently listed then let us know. XJFlash can be used on a wide range of FPGAs from Altera, Lattice, Microsemi (formerly Actel), and Xilinx. Can I use XJFlash on boards I’ve already designed? Yes. XJFlash transfers all data from the PC to the board via the FPGA’s JTAG port, which is commonly brought to a header on the board for use during development. Therefore, provided this has been done and the flash to be programmed is accessible from the FPGA, XJFlash can be used. My flash is not connected directly to the FPGA on my board, might I still be able to use XJFlash? Yes. XJFlash can easily be customised to support scenarios where the FPGA is not directly connected to the flash to be programmed. For example, the signals could go through buffers, latches, a CPLD or other forms of logic, and XJFlash can still be used. Furthermore, even if some of the signals have to be serialised to get them between the FPGA and a CPLD, XJFlash can be used. Not all the signals on my flash are accessible from the FPGA, surely that makes it impossible to use XJFlash? This all depends on the type of flash to be programmed and which signals are accessible. XJFlash is designed to allow the FPGA to be included in a JTAG chain with other devices, which means some signals can be controlled using boundary scan from other devices whilst XJFlash runs on the FPGA. Contact us to find out if XJFlash can work in your case. Is this limited to only programming FPGA configuration devices? No. Due to XJFlash’s ability to create custom FPGA images for each board design, it is not restricted to only programming the configuration device. I’m not an FPGA developer, will this be too complicated for me? No. Although XJFlash requires a custom FPGA image for each design of board, this is an automated process controlled by XJFlash. This requires the relevant FPGA vendor’s tools to be installed on the PC used to develop the tests, but you won’t have to use them yourself. Will I have to buy extra FPGA tools to be able to use XJFlash? This depends on the FPGA being used. Many FPGAs are supported by free versions of the various vendors’ own tools. For these FPGAs no additional products would need to be purchased. For larger FPGAs, contact your FPGA developers, or contact us. Can I simultaneously program multiple PCBs, each with their own flash devices? Yes – because XJFlash can be added to a sequence of production tests, concurrent programming can be implemented in exactly the same way as concurrent boundary scan testing. Can I use XJFlash both in high-volume and low-volume/high-mix production situations? Yes – because XJFlash can be incorporated in your production tests and it uses the FPGA built on to the board, there are very few time overheads and no hardware modifications required when switching between different board designs. This can’t be faster than the FPGA vendor’s programming tool, can it? XJFlash has been found to be faster than many commonly used flash programming tools, so why not try it and see for yourself? Contact us. Do you support fast Flash programming attached to microprocessors, CPUs, DSPs? Yes – please contact us for more details. What are the recommended system requirements to run XJFlash? Yes. 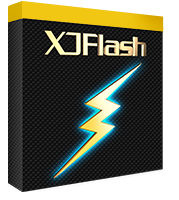 If you already have XJFlash for evaluation, you can continue using it without interruption by purchasing the full licence. Contact your XJTAG distributor to make a purchase and have your licence extended. Do I need to purchase an XJFlash licence for each XJRunner I want to use? No. An XJFlash licence is required to create the programming configuration for a particular board, after which that configuration can be used with any XJRunner on the same board.